Streaming video service Hulu is giving its cord-cutting users more options of what to watch thanks to an agreement with Home Box Office, one which allows Hulu viewers to add the premium channels HBO and Cinemax to their subscriptions for an extra monthly fee. As part of the deal, subscribers of Hulu's on-demand and live Internet TV services can add HBO and Cinemax to their packages, regardless of their current subscription tier. Customers will have to pay $14.99 per month to watch HBO through Hulu, $9.99 per month for Cinemax. Notably, the prices to add HBO and Cinemax are approximately the same as adding the channels on other streaming video services, including the standalone HBO Now service. By contrast, Hulu added Showtime at a discount in 2015, with customers paying premium of $8.99 per month, approximately $2 cheaper than competing services. For the subscription, users will gain access to the east and west coast HBO and Cinemax live feeds, allowing them to watch shows like "Game of Thrones" at the time it first airs, or alternately through on-demand after the premiere. The subscription also includes on-demand streaming of the HBO and Cinemax back catalogs, including seasons of "Westworld," The Sopranos," and "Silicon Valley." Aside from the initial live feeds, more channels will be made available to subscribers in the coming weeks, including six HBO and six Cinemax channels. 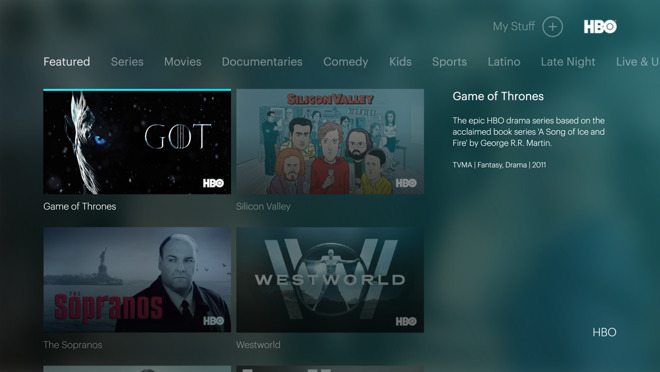 Those buying the HBO add-on through Hulu will also gain access to HBO Now. The new add-ons will only be available to customers using Hulu's new user experience, which includes the fourth-generation Apple TV and iOS apps, as well as the Xbox One console and Android mobile devices. Hulu advises the new add-ons will be available on other platforms once the upgraded user experience rolls out over the course of this summer.